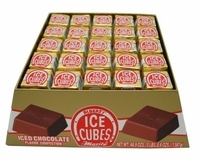 Chocolate Ice Cubes are one of the best chocolates bars around. Cubes of creamy chocolate with in iced chocolate flavor. These chocolate ices are truly a gourmet chocolate and are imported from Germany. Not only will they melt in your mouth but also in your hand as they are very delicate. These are one of our most requested old time candies now smoother and more chocolaty then ever. Many of times when you talk about chocolate ice cubes people look at you like you are nuts. If you have never tried one now is the time, but let me warn you once you start eating them it is almost impossible to stop at just one or two. Years ago they could be found in every corner store, today they are hard to find in any local store. IF you are a chocolate lover then these iced chocolate cubes are for perfect for you, as far as chocolate bars go, they don't get any better then this. Ice cubes make great wedding favors, party favors and a perfect present for the chocolate lover. 100 Moritz chocolate ice cubes in a cute ice cube shaped box. Please not that ice cubes are a very delicate chocolate and will melt in temperatures over 65 degrees, please keep this in mind when purchasing. You will need to add ice packs and select air methods of shipping in the summer.